"The hotel owner was very nice, could talk in English." Have a question for Island Tree Pension? "The room also very comfortable and suitable for family." "We both enjoy to stay here :)"
"This is a good place to relaxing, and have a nice view, nice..."
When visiting Jeju Island, you'll feel right at home at Island Tree Pension, which offers quality accommodation and great service. Only 34km away, this 2-star hotel can be easily accessed from the airport. With its convenient location, the hotel offers easy access to the city's must-see destinations. At Island Tree Pension, every effort is made to make guests feel comfortable. To do so, the hotel provides the best in services and amenities. A selection of top-class facilities such as free Wi-Fi in all rooms, convenience store, laundromat, kitchen, 24-hour front desk can be enjoyed at the hotel. Experience high quality room facilities during your stay here. Some rooms include television LCD/plasma screen, internet access – wireless, internet access – wireless (complimentary), non smoking rooms, air conditioning, provided to help guests recharge after a long day. Besides, the hotel's host of recreational offerings ensures you have plenty to do during your stay. 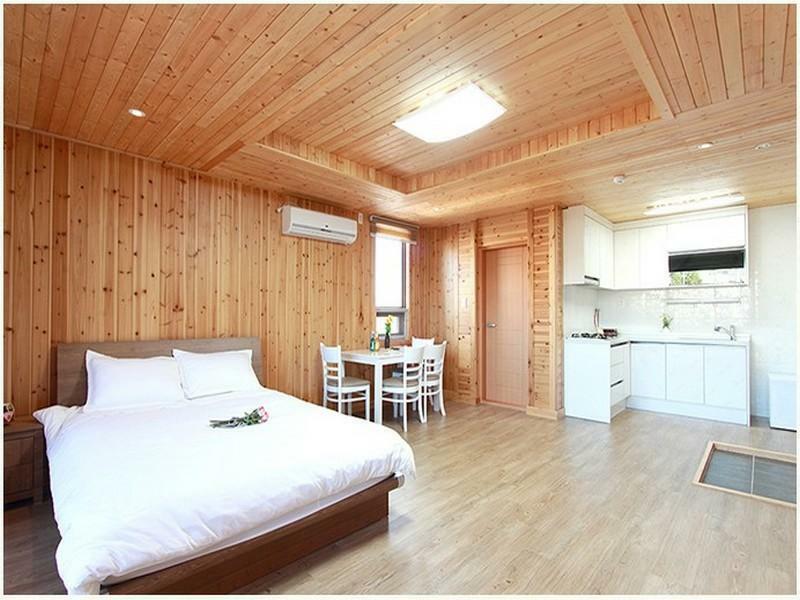 Island Tree Pension is a smart choice for travelers to Jeju Island, offering a relaxed and hassle-free stay every time. "Real clean place, cozy and owner is really friendly!" This is a good place to relaxing, and have a nice view, nice weather and also have a nice boss. He very cute, kindness and very helpful, he will try to help if you have anything problems/questions. The room also very comfortable and suitable for family. The location is just few minutes walking to the beach, in which you can have a fantastic view everyday when you wake up. It is a good place to hang out with a scrumptious breakfast prepared by the lovely host, Kim. Thanks Kim for the Jeju football, we love you and your pretty wife. We will definitely return some day. He can provide useful information to u . Real clean place, cozy and owner is really friendly! Helped us to find all the good food without burning a hole in our pockets! Quiet place, good air. Will book this place again if returning to Jeju! Room is spacious though location is far from from airport. Boss- Mr Kim is helpful and make good breakfast. Is like home away from home. The room is clean and big enough. The boss is very nice. Amazing hospitality by Mr Kim and his cousin Mr Zheng, who prepared handmade breakfast and went out of their way to recommend an awesome food place and arrange for a submarine experience for us! The owner was friendly and helpful. Its location is decent, slightly away from the main road, not easily accessible unless you have a car. We were disappointed with our room. We booked a deluxe sea view room but instead of sea view, the room is directly next to a construction which not only blocked our view but there were noises from the construction site from early morning till evening. We stayed for 2 days and there was no room cleaning services in between days. It was great. really great host. He helped a lot in our planning as he knows a lot about Jeju and speaks relatively good English. The place is spcious yet cosy. Very nice stay overall. We only spent 1 night in Island Tree Pension but it was memorable. The owner is so friendly. He made breakfast for his guest by himself. We got a room with beach view, the view is marvelous. The room design is so homey. So laid back and relaxing. The host is very nice and helpful. The breakfast is really nice. Rooms are clean and cozy and the whole environment makes you feel like home. Will definitely stay in the same place if we were to return to jeju. Friendly and helpful host, quaint getaway. The location is remote, but if you hire a car, then this doesn't matter. A super warm welcoming from Mr.Kang when first time we reached this guesthouse for check-in. They provided good korean breakfast along our stay. The room is spacious gully equiped with kitchen and bathroom. We really satisfied with the service and definitely be back when we visit Jeju again.